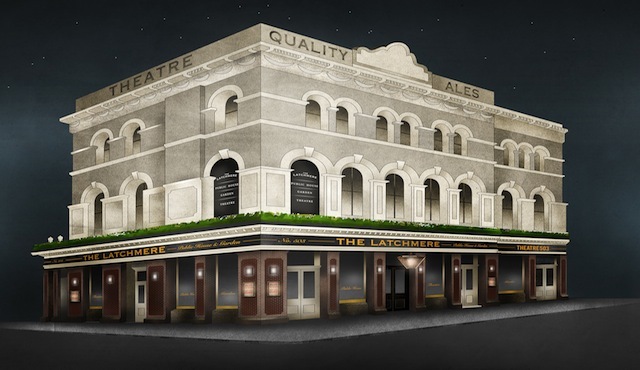 Coming Soon – The Latchmere | Three Cheers Pub Co.
Late May will see the long awaited opening of The Latchmere, in Battersea. The stuff of South London legend, the public house, garden and theatre has undergone a huge regeneration after being left to ruin by its previous owners. Now in the safe hands of Tom Peake, Mark Reynolds and Nick Fox from Renaissance Pubs, they are in the midst of reviving the Victorian venue, harnessing its heritage and proving the potential of one of the most beautiful buildings in the local area. The interior will regain its original grandeur and striking design, with cleverly designated areas for drinking, eating and after-dinner lounging. Outside will be transformed with a garden of four distinct parts. The first will be covered and include overhead and under-seat heating for the peskiest of English summers, the second will be an exclusive exterior party room for up to 12 people, the third, a proper play area with playhouse and toys for the children, and the fourth, an area simply for smokers. Food at The Latchmere will also keep everyone happy. Doing what every pub should do extremely properly, they promise always to serve a cracking fish and chips, the best burger, the perfect pie and mash and a superlative steak. For the first time they will also be showcasing their very own hand – crafted British charcuterie. As with all Renaissance Pubs, a large portion of its meat is hand-reared at their farm in Hampshire and all fish is sustainably sourced from English day boats off the South Coast. Drinks will receive a similar level of attention. A 25 litre giant Sipsmith gin balloon will sit on the bar, setting the scene for house spirits which are hand-crafted as well as cocktails which are beautiful, simple and restrained. The wine list has been created for whatever kind of day you’ve had, whether you deserve something special or shouldn’t really be out in the first place. Renaissance Pubs will continue to work with the Oliver award-winning Theatre503, located on the first floor of The Latchmere, Theatre503 specialise in ground-breaking plays and stage over 300 shows a year. Customers can walk freely between both parts of the building.